The wait is finally over and today sees the long awaited release of “Dead And Alive”, the new studio album from German Melodic-Death-Newcomers PARASITE INC. via Reaper Entertainment! To celebrate the release of the album, the band present a new lyric video for the track “This World”. Check it out HERE. The band will play their official release show on this year’s SUMMER BREEZE Festival in Dinkelsbühl. PARASITE INC. will hit the MAINSTAGE, tomorrow (August 18th) on 11:00am CET. With the review to PARASITE INC.’s official debut album “Time Tears Down” in late summer 2013 Germany’s leading metal magazine Metal Hammer summed it up pretty well: “When in modern melodic death metal a young German band succeeds to become a talking point, there must be something behind it!”. Words that are truly emphasizing the young band’s musical qualities considering that their first official and self-produced album already hit the top 30 of Germany’s official metal-rock-charts as well as the 12th position in Japan’s import charts. 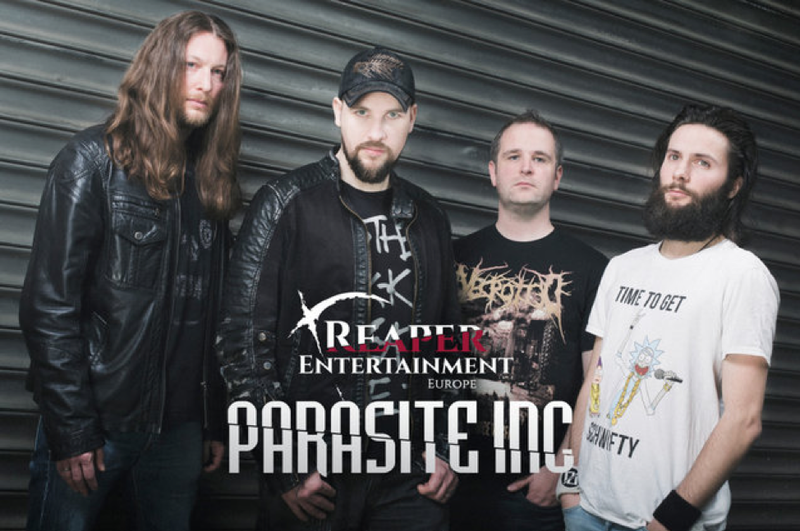 PARASITE INC. like their metal melodic but death and so does their continuously growing fan base worldwide: no clean vocals, no softeners, no compromise.